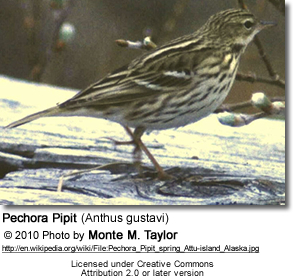 The Pechora Pipit (Anthus gustavi) is a small passerine bird which breeds in the tundra of northern Asia, eastwards of Russia. It is a long-distance migrant, moving in winter to Indonesia. Rarely in September and October, the Pechora Pipit may be observed in western Europe. Probably the best place in western Europe to see this rare species is Fair Isle, Shetland. The lack of cover on this small island makes skulking passerines easier to find. A. gustavi is a small pipit, which somewhat resembles the non-breeding Red-throated Pipit. The species is heavily streaked brown above, with whitish mantle stripes, and with black markings on a white belly and buff breast below. It can be distinguished from Red-throated by its heavier bill, whiter mantle stripes, and contrast between its buff breast and white belly. This species creeps in long grass, and is reluctant to fly even when disturbed. Its call is a distinctive electrical zip. Although the call is generally helpful when identifying pipits, this species calls far less than most. This, combined with its skulking habits, makes this a difficult species to find and identify away from its breeding grounds in the Arctic. The breeding habitat is damp tundra, open forest or marshland. The nest is on the ground, with 4–5 eggs being laid. This species is insectivorous, like its relatives.